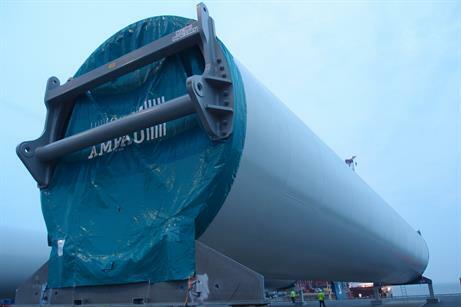 GERMANY: Tower manufacturer Ambau has released pictures of the tower for Mitsubishi Heavy Industry's (MHI) 7MW SeaAngel offshore turbine being shipped to the Hunterston site in Scotland. Ambau manufactured the tower for MHI. It totals 106 metres with a 7.33-metre diameter at the base flange. 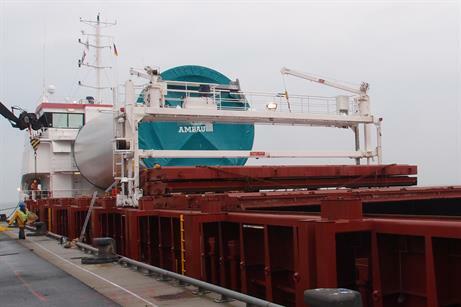 The tower was manufactured at Ambau's German facilities before being shipped from Cuxhaven Port. Ambau said it worked closely with MHI's technicians in Japan. 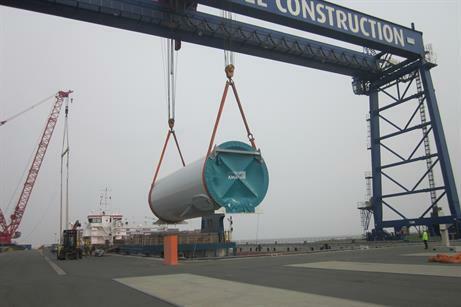 The tower is produced in four parts, and all of the segments were shipped from the port to Scotand in September before being installed onshore at the Hunterstone demonstration site. Weather has delayed the construction of the SeaAngel turbine but MHI hopes to complete it by Christmas.